George Clooney didn't even have to leave his lakeside home in Italy to woo his wife Amal. The 56-year-old movie star opened up about he met the human rights barrister in 2013, in conversatino with David Letterman for his new Netflix show My Next Guest Needs No Introduction. Clooney said it was like any other day at his plush Lake Como home, which likely is still better than the average person's good day, and an unnamed friend asked if he could pop over and bring a friend. The friend, of course, was Amal and they hit it off instantly. "It’s the wildest thing," George says. "A mutual friend of ours said, 'I’m stopping by and can I bring my friend?' And I was like, 'Of course'." And then his agent got in touch to tell him he'd fall in love with the guest, accurately predicting a wedding. "He said, 'I met this woman who’s coming to your house who you’re gonna marry'," George adds. "The funniest thing was my mom and dad were visiting, so my parents were there, and we just talked and we stayed up all night talking and then, you know, I got her email address 'cause she was going to send me some pictures of my parents and then, we started writing..."
"I didn’t know if she wanted to go out with me," he recalled "I just thought, you know, we were buddies." 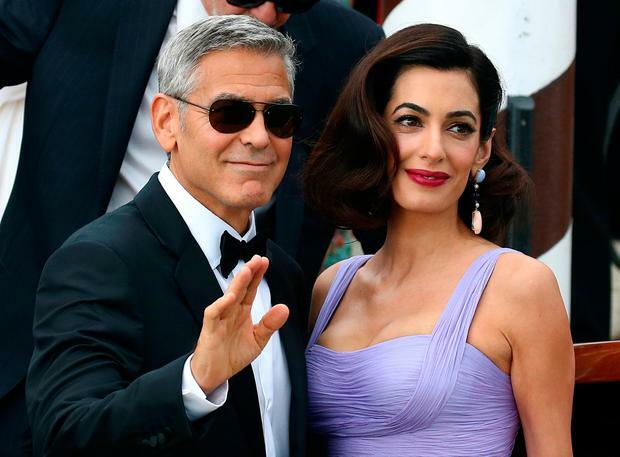 The couple wed in September,2014 and Amal gave birth to twins Ella and Alexander last year. George and Amal Clooney in Venice in 2014.